This project has been approved by Heritage Canada's Canada 150 Team and each coin will incorporate the Canada 150 logo. The series will also have the custom tracking code prefix 'EH'. The first coin in the series covers the three maritime provinces -- Nova Scotia, Prince Edward Island, and New Brunswick. These three provinces are each comparatively small but of huge importance to our nation. Nova Scotia and New Brunswick were two of the first four provinces to join confederation, and Prince Edward Island played host to the first conference where the union was discussed. This first coin is made up of four parts: the base, and the three provinces. 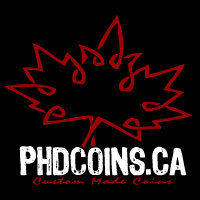 Each provincial piece will have its own tracking number and its own unique icon -- so this is actually three geocoins in one. Each provincial piece is held on the base piece with a magnet. The base piece is shaped to show Canada's 200 nautical mile maritime limit.